We are all in search of the perfect lip balm. I know you are and I know I have been. Well I think I may have finally found it. It is an assuming little product that isn't very flashy and isn't very expensive but boy does it do its job. The product I am speaking of is Glossier's Balm Dotcom Universal Skin Salve. This product comes in a translucent, untinted color as well as five other shades/flavors that are not as aggressive by today's standards but give the balm a hint of tint or flavor. It comes in untinted, Birthday (subtle glitter), Rose (translucent pink), Cherry (sheer red tint), Mint (untinted cooling flavor) and Coconut (beachy and untinted). I got the untinted this time but think I am going for coconut next time. The Glossier Balm Dotcom is a hydrating, long-lasting multipurpose lip balm and skin salve that's packed with antioxidants and natural emollients to nourish and repair dry, chafed skin. The dense, waxy texture stays in place to seal in moisture wherever it goes, Opt for original or choose form five mood-enhancing flavors. The lip smacking 11-year old in you is freaking out right now. Collect them all! What I love about this lip balm is that it does on and stays on. When I am not wearing lipstick, I only have to put this on about three times a day. And that is after I eat. That is how well it lasts. It isn't one of those balms that gets put on and then you immediately lick it off. This is a balm that wears well and will last forever. It is so good and doesn't require a lot of balm per use either. I say one tube could last 3 months, easy. I adore how the balm just sits on the skin and is amazingly rich and waxy. It contains castor seed oil, a natural plant extract, the thick emollient has unique water-binding properties that keep moisture locked in. Beeswax, a completely natural wax that is also a natural emollient which acts as a protective barrier. Lanolin is a natural emollient that’s good for sensitive skin. Cupuacu Fruit Extract is an organic, long-lasting moisturizer with Omega-6 and Omega-9 fatty acids that melts into skin on contact. Rice Bran & Rosemary Leaf Extracts are antioxidants to combat free-radical skin damage. Vitamin E is an antioxidant and a moisturizing emollient that helps protect against free radical damage while also protecting lips from the drying air around them. You can save $6 and build a Balm Dotcom trio. that will allow you to have three Balm Dotcom flavors/tints and get the most bang for your buck. Apply a small amount with fingers to any part of the body that needs extra moisture, especially lips, cuticles, and rough patches. 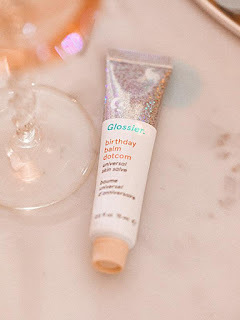 Glossier Balm Dotcom is available online at www.glossier.com. Like Glossier on Facebook: https://www.facebook.com/glossier; Follow Glossier on Twitter: @glossier; Follow Glossier on Pinterest: https://www.pinterest.com/glossiernyc/; Follow Glossier on Instagram: http://instagram.com/glossier and Subscribe to Glossier on YouTube: https://youtube.com/glossierTV.